After you find a comfortable place to meditate, focus on increasing your self-awareness and activating your inner light. Jess’ voice is gentle, soothing and calming, the content is structured and well-timed, however, the music is oddly dominating and somber. Honestly, running water would’ve been a better substitute. 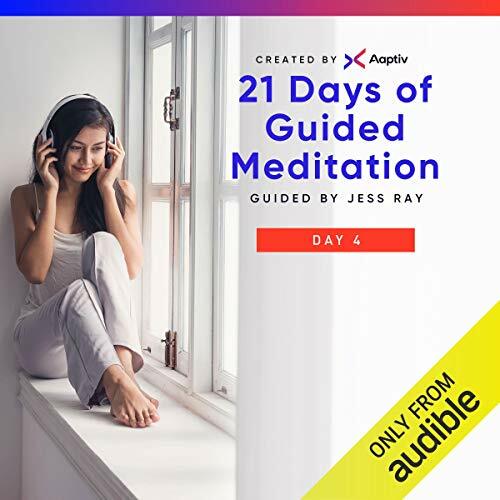 Day 4 is all about breathing and it was easy to follow the narration in a peaceful manner (no added thinking or questioning what the narrator was conveying and no time to wander between pauses). Not really meditation, more breathe instruction. As part of the new year I am trying to devote more time to meditation, and an easy place to start was with this series. Meditation isn't a new practice for me, but I haven't meditated every day, ever. That said, I was hoping to be gently led down a meditation path where I could build in 10 minutes of meaningful meditation a day and at the end of the 21 days in this series have a good enough anchor to do more. This has not been my experience so far as each day doesn't seem to build on the previous experience and each session has had unexpected challenges (confusing instructions, too much dialog..). The titles are confusing and the message (narration) takes up all the "space". So at day 4, I'm not sure what to expect next but have committed to this series and enjoyed todays breathing exercises.